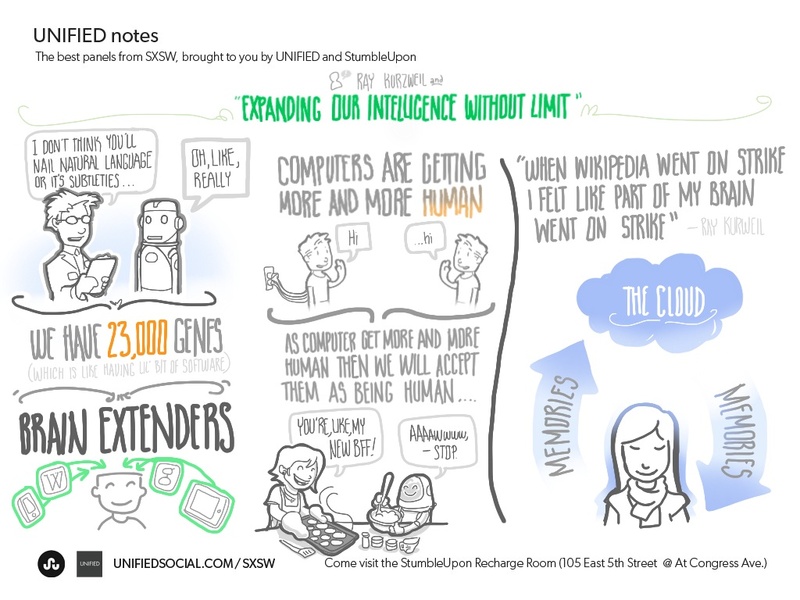 Time magazine’s Lev Grossman interviewed Ray Kurzweil at SXSW Interactive to a packed house on Monday, March 12, 2012. If you didn’t get a chance to attend, science-fiction author (Avogadro Corp: The Singularity Is Closer Than It Appears) William Hertling took the careful notes below. The hippie movement morphed into silicon valley movement. What we have today is the democratization of technology. You don’t need millions of dollars — you can start world-changing revolutions with what you have (11 year old girl starts blog, now at 14 is on the cover of vogue with her own fashion line). A boy in Africa today has access to more information than a U.S. President 15 years ago. “Hardware increases exponentially, but software is stuck in the mud” is an erroneous comment by some critics. Watson is very impressive because it’s able to handle the vagaries of the human language. Made a prediction that computers would beat humans in chess by 1998, and that immediately afterwards we would dismiss chess as a non-significant program. Watson is dealing with human languages. It master human language by reading 200 million pages of English content. It can call up any fact in less than 3 seconds. Some may say that it doesn’t understand it: because it is just statistical extraction of data. But this is exactly how the human brain works. Watson is not operating at human levels of intelligence yet. It combines the capability that it does have with natural language, and combine that with what computers are good at: having total recall of all information. Computers are shrinking at an exponential rate: a 1000x decrease in size and 1000x increase in performance since Kurzweil was an undergrad. Moore’s Law is only one example. If you measure the basic fundamental aspects of technology, they are very smooth curves over time. Paradigms shift: from vacuum tubes to IC. But overall, the curves are very smooth. And the bits we move around on wireless networks. A very important area is biology. It wasn’t an information technology problem until recently. DNA Sequencing cost: dropping exponentially. Growth in Genbank DNA Sequence Data: increasing exponentially. Our genes are 23,000 software programs running in our bodies. Health is now a software technology problem. Therefore, it will now be subject to exponential increases. The world of physical things becoming information technology. Someone printed an airplane and flew in it. At Singularity University, we want to print out low-cost housing. The spatial resolution and precision of brain scanning is doubling. The precision of brain simulation is doubling. Plot of incoming and life expectancy around the world. increasing for everyone. divide is still there, but the lowest countries also increased the most. Plot of education over time. What do you think of Siri? What does it mean for the landscape of AI? It’s great. People who complain remind me of the joke about the woman who has a chess playing dog, but complains that it has a lousy endgame. Turing test: Is it still the benchmark for recognizing self-awareness? To say that it is sentient is just bizarre. What will it take for people to recognize it as sentient? Of all the different proposals, it still has the most credibility. We look like we’re heading for a date of 2029. As soon as we pass it, we’ll probably reject it as a valid test. People will accept an entity as conscious and as a person when it seems that way: when they convince us that they have the complexity and subtly to be our equals. Where is the serious progress going to come from? Is it from Siri? Watson? Somewhere else? It’s going to come where there is commercial value. Watson is understanding sequences of words. It would be of tremendous value for search engines to be able to do this. In the future, search engines won’t wait to be asked, they’ll be listening in, and they will pop up information we need. We’ll get used to having this information pop up in some sort of augmented reality. Are they going to judge us for our search terms? Making judgements is the top level of our neocortex. It’s not built in, it’s built up over time, based on what we think. We need a whole framework to make judgements. These systems will make these judgements: what does Lev Grossman want vs. what someone else wants. How much confidence do we have that if greater than human intelligence arises, it will want to be helpful? Promise vs. peril has been an issue with technology since we had fire: it can cook food, but it can burn down our villages. Biotechnology has great promise and great danger: it could be used by terrorists, and it can be used to arrest cancer. Genetics Nanotechnology Robotics (GNR): promise vs. peril is a very large issue. It’s not as much an us vs. them, but an us vs. us. We have conflicts today between groups of humans. They will add GNR into the tools they use for that conflict. We are a human machine civilization. It’s going to be all mixed up: we are all enhanced with computer technology. We do have conflicts between humans. GNR technology can make these conflicts more harmful. Should governments be more active in regulating? Conflicts come from governments. So they should not regulate. We (SXSW people) should be the ones to regulate it. Look at the major political power of Wikipedia: it killed SOPA in hours. When we talk about intelligence expanding, with technology, does it change us quantitatively or qualitatively? Does it change human nature? Mammals evolved and have a neocortex. It was the first time we had an hierarchy of information. Then we had a mass extinction event. Given the radical sudden change in the environment. the mammals survived because they adapted. Evolution recognized this, and used it more. Now we have a front cortex. If you take a congenitally blind person, the regions of the neocortex used for visual end up getting used for more advanced capability of language analysis. We have about 300 million pattern recognizers in the neocortex. If we extend it, and are able to have even more complex thoughts. Backing up the consciousness in the cloud. My experience of the reality around me and the people around me feels diminished when I am buried in my smartphone during this conference. Is this a zero-sum game? There was a big controversy that kids weren’t going to learn arithmetic when calculators were invented. And in fact, they don’t. We’ve outsourced some of our ability to technology. It frees up our energy to be able to do other creative things: like the people at the conference. We are free to choose how we spend out time and how we organize it. You are communicating with other people, either directly or indirectly. It has expanded our minds. We have a 19th century model of education. In Paul Allen’s essay: published a few months ago, “The singularity is not here,” he said the law of exponential growth is not a physical law. It’s just an observation until it no longer works. What if we hit a wall? Moore’s law will come to an end: but that’s just the fifth paradigm. Before we had transistors, before that we had vacuum tubes, before that we had mechanical computers. Paul is confusing the end of one paradigm with the end of all growth. We’ll go on to another paradigm. Have you been wrong with your predictions? In terms of the underlying capabilities: everything has stayed right on the curves. In terms of social predictions: those are harder. I rate myself as 86% correct on my social predictions… Like having self-driving cars. According to a research presentation at the Singularity Summit large year: the complexity of even a single cell is immense, and it will be impossible to simulate it all. There is massive redundancy. When we look at how much information is encoded in the genome, you realize that the connections are redundant. In the cerebullum you have connections wired together 10 million times. Massive levels of redundancy. You could say a forest is incredibly complex, but there is fractal redundancy. How confident do you feel that the kinds of marvelous benefits that are coming will be available to the 99%? You have to take a lot of comfort from where we are today. Twenty years ago, if you took our a mobile phone, that was a sign that you were an elite. They were big and heavy and limited functionality. Now they can do so much more, and are small, and they are in everyone’s hands. Every field is being empowered by increasingly inexpensive and increasingly powerful tools: music, health, etc. They will make their ways into our bodies and brains, but that’s an arbitrary distinction. I don’t see a tremendous power being given to an elite. Say you’re graduating from college right now. What would you want to do to get yourself ready for the decades to come? All of our education needs to encompass doing as a centerpiece of the curriculum. If I was a student, I would be at an institution where that was how it was done.